The blockbuster sci-fi prequel comes to Blu-ray in December! In an early announcement to retailers, 20th Century Fox will be bringing 'Rise of the Planet of the Apes' to Blu-ray on December 13. 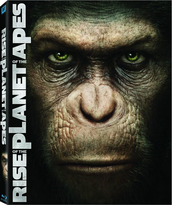 Specs have yet to be revealed, but supplements include: Pre-vis for The Future; Capturing Caesar – Script to Screen; Studying the Genius of Andy Serkis; Multi-Angle: Rocket Cookie Scene; A New Generation of Apes; Breaking Motion Capture Boundaries; Breaking New Sound Barriers: The Music and Sound Design of Rise of the Planet of the Apes; Ape Facts (Chimpanzee, Gorilla, and Orangutan); Audio Commentary by Director Rupert Wyatt; Audio Commentary by Writers Rick Jaffa and Amanda Silver; Character Concept Art Gallery; Deleted Scenes; Three Theatrical Trailers; and a Digital Copy. You can find the latest specs for 'Rise of the Planet of the Apes' linked from our Blu-ray Release Schedule, where it's indexed under December 13.